Dolphin watching – is this work :-) ? We never quite know what the day will bring. Tim and Charlie had great conditions yesterday morning for landing the RSPB on Grassholm for gannet monitoring. En route home they stopped to pick up some floating rope and were joined by dolphins. Later that afternoon they headed back out to Grassholm via the waters off the Smalls lighthouse (good fishing!). They were joined by more dolphins. Dolphin watching is always pretty awesome but when the water is this clear and you have the added bonus of sunshine glinting on the ocean it really is quite something – see here for video. 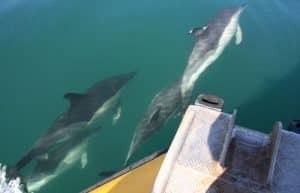 Summer is an ideal time for dolphin watching off the Pembrokeshire coast. It’s a big ocean so no matter how often dolphins come up to us it’s still pretty exciting. We don’t have to worry if they investigate the back of the boat – we’re jet driven so there are no propellers so it doesn’t matter how inquisitive they are or how close they get. We can just enjoy watching them. Not every day at the office is quite this relaxed 🙂 but Pembrokeshire seas and wildlife ensure that no-one ever gets bored.